In our opinion this is the best offering from Sole Fitness. 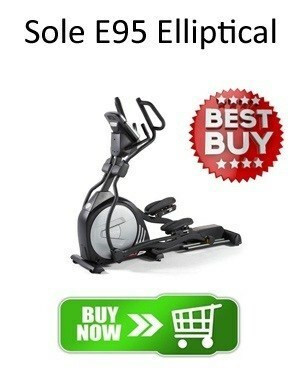 The Sole E95 elliptical trainer offers close to gym quality at affordable prices and without compromising on quality. In this price category this is one of the stand out machines - definitely worth a closer look. The Sole E95 is their top end offering and it is close in quality to commercial gym trainers without the extravagant price. It is one of the best selling mid-price machines on the market and definitely worth a look if you can afford it. Commercial-quality elliptical exercise equipment is becoming more available to regular home users who want the efficiency and the durability of these machines, coupled with the comfort of their own home. For those of you who prefer working out at home, there are a lot of makes and models to choose from, depending on your needs. 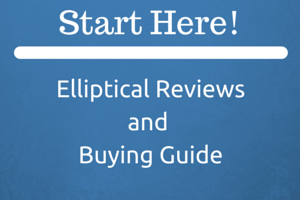 If you are looking to buy an elliptical trainer that fits the description above, you might want to check out the E95 Elliptical review. Sole Fitness went out of their way to create a high-quality piece of equipment, and the result is the E95. The unit is constructed out of high-strength tubular steel which, in addition to providing a wide, sturdy base, allows the E95 to handle anything you can throw at it, and by anything we mean anyone that weighs up to four hundred pounds. Providing contrast to the E95’s heavy-duty, robust construction is the extremely quiet motion which makes it ideal for exercise on any location, as long as there is enough space to for it to fit. The pedals on the Sole E95 Elliptical are a little special – they were designed with the help of some of the most renowned physical therapists, and Sole engineers used their knowledge to construct a two-degree inward slope to the foot pedals, which puts even less pressure and stress on your ankles and knees – a feature usually only on much more expensive trainers. Also, the foot beds can be adjusted for greater comfort. Sole has thought of everything, and they have realized that every one of us walks differently, so these pedals are articulated, as well, which means they follow your stride perfectly. No more “numb toe effect”, or sore Achilles tendons, which can occur with poorly designed machines. The E95 Elliptical also features a large LCD panel which displays all the necessary workout data, and it also allows you to choose between one of the 10 pre-programmed exercise routines. The large, 9-inch LCD panel allows you to take a look at all the vital statistical information regarding your training in real time. It also has an integrated dual heart rate monitoring system, with pulse sensors built into the stationary handlebars, as well as the monitor which you can attach to your chest while you work out, and which communicates wirelessly with the control console. All the information gathered while you exercise can be used for your personal use or you can use it as part of one of numerous pre-set heart rate workout routines. 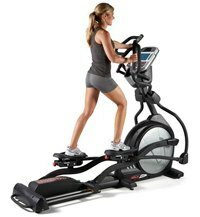 This model from Sole Fitness is beneficial to your cardio workout routine in many ways, because it couples little or no impact aerobic workout with upped body training, since it comes with movable handlebars. In case you want to mix it up or go a more traditional route, you can also use the fixed handle bars. Seeing as you can choose which handlebars you will use during your exercise, you can adapt it to meet your goals and expectations a lot closer. Keeping up with the tradition of our research, first, we analyzed the online user reviews, posted by those who thought their experience might help you decide on whether or not you should buy the Sole E95 Elliptical. This particular exercise unit was met with favorable reviews among the people who bought it. According to them, the Sole Fitness E95 is a high-quality piece of exercise equipment, well-engineered, and, even though it had some minor flaws regarding the design, the overall impressions were great, and it justified its price tag. Prior to this review, we weren’t very familiar with Sole’s elliptical trainers, so we were pleasantly surprised. The E95 not only rose to the occasion and lived up to our expectations, but it is right up there with some other great – and more expensive machines. The Sole E95 Elliptical Machine’s low impact mechanism is also praise-worthy, and we were impressed by the smooth and comfortable ride. The fact that you are also able to monitor your heart rate, whether using the sensors in the handlebars, or using the chest strap monitor, allows you to make full use of the pre-programmed workout programs, which are tailored to fit a certain heart rate. The chest strap heart monitors are always more accurate but not everyone can be bothered using them. One of the minor design flaws we noticed is the fact that your portable music player, like an iPod, has to be mounted in such a way that is blocks your view of the display, which is a strange decision on Sole’s part. As is usually the case with built-in speakers on these devices, power leaves something to be desired, so you might want to stick with a good set of headphones. Also, cooling fans are there, but their purpose is purely symbolic, since you won’t be able to feel any of the cool air – again very common with even the most expensive trainers. These are pretty minor gripes for what is a truly impressive elliptical trainer especially considering the price! The Sole Fitness E95 Elliptical Trainer is great piece of exercise equipment, which will surely meet all of your needs – especially in this price bracket. It punches above it’s weight! Some of the cons we listed mostly revolve around creature comforts but apart from that, this machine is highly recommended if you are looking for a sturdy, high-quality elliptical trainer which will help you produce great results. Is it worth the extra compared to the Sole E35 … definitely if you can stretch the extra dollars. 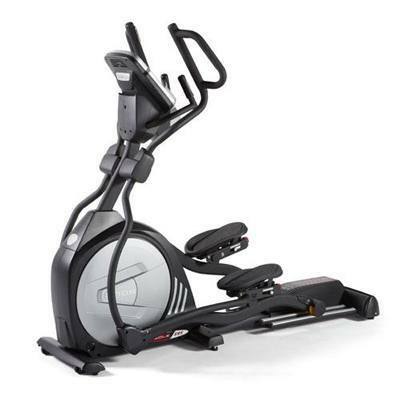 Check out the Sole Fitness Ellipticals page for their full range. Back to main Elliptical Reviews.